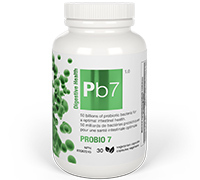 Probio 7 replaces Probio 5, this new improved and more powerful formula with 20 billion more bacteria and 2 quality strains for the same price! Helps support intestinal/gastrointestinal health. Could promote favorable gut flora. Helps reduce the incidence of cold-like symptoms in stress adults. Probiotic to benefit health and/or confer a health benefit. Reduces the duration of acute infectious diarrhea. An adjunct to physician-supervised therapy in patients with Helicobacter pylori infections. For the maintenance of a balanced vaginal flora by pregnant woman who have undergone a caesarean section and undergoing post-operative antibiotic therapy. Adults : For probiotic, gut flora, intestinal health, and cold-like symptoms: Take 1 capsule, 1 time per day. If you are on antibiotic(s) take at least 2-3 hours before or after. Take with food. For acute infectious diarrhea: 2 capsules, 3 times a day. For H. pylori infection: 2 capsules, 2 times daily. For balanced vaginal flora with antibiotics: 1 capsule, 3 times a day, 2-3 hours after antibiotic use. For healthy microflora with antibiotics: Adults (2 capsules, 2 times a day, 2 or 3hours after antibiotic use), Pregnant women (1 capsule, 2 times a day, 2 or 3 hours after antibiotic use). Use for a minimum of 6 weeks to see beneficial effects on cold-like symptoms, 7 days for acute infectious diarrhea and for balanced vaginal flora with antibiotics, and 20 days when used as an adjunct to physician-supervised H. pylori therapy. practitioner prior to use. If symptoms of digestive upset (e.g. diarrhea) occur, worsen or persist beyond 3 days, discontinue use and consult a health care practitioner. long-term corticosteroid treatment), do not use this product. This product has come into contact with soy and milk. Do not use if you have a soy or milk allergy.